American Samoa is a country with a traditional Polynesian economy, which means that more than 90% of the land is communally owned. The economic activity of the island has a strong relation with the US, which is the country's major export partner. The most important economic sector of the American Samoa is fishing. It should be mentioned that American Samoa is one of the world's major countries processing tuna. Tuna cannery sector employ the most of the labour force and contributes the most to the country's GDP. The American Samoa's government aims at diversifying economic sectors, which are restrained by the island's location, limited transportation and climatic conditions. Tourism is one of the developing economic activities. American Samoa is the 191st largest export economy in the world. Regarding its top exports, the following products should be mentioned: non-fillet rozen fish, canned tuna, natural polymers, raw cotton, pet food and aluminium. The islands major export partners are the US, Australia, Colombia, Indonesia, South Korea and Tanzania. The economy of American Samoa is dependent on the US, as the US government provides about 60% of the island's revenue, and is the American Samoa main export destination. The most important industries are represented by tuna canneries, handicrafts and public service. Because of the frequent natural disasters, agriculture in American Samoa is fragile. However, several crops are cultivated: coconuts, copra, bananas, breadfruit, vegetables, pineapples, yams, papayas and taro. The American Samoan government is working at developing other economic sectors. Tourism and e-commerce are two of the targeted sectors. Other emerging economic sectors are: distance learning and technical service industry; airfreight services; live-catch fish export; diversified agriculture; real estate development. Analyzing the American Samoa economic profile, it should be mentioned that the country is the world's 193 largest importer. Refined petroleum, paper containers, fish, building materials, fresh milk, tools and tin plates represent the American Samoa's major imports. Its main import partners are South Korea, Malaysia, Singapore, New Zealand and Fiji. American Samoa is part of the Samoan Islands chain, situated west of the Cook Islands, north of Tonga, and south of Tokelau. It is an unincorporated territory of the United States in the South Pacific Ocean. 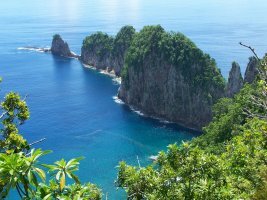 American Samoa consists of five main islands and two coral atolls. It is a member of the Secretariat of the Pacific Community, the Universal Postal Union and other international organizations. Phytosanitary import permits may be obtained from the Plant and Animal Quarantine Service or the Department of Agriculture of the American Samoa. It should be mentioned that all consignments of imported plant material are subject to inspection for phytosanitary purposes on arrival.